– Lucky to be alive, Canadian cyclist Luke Rae narrowly avoided serious injury while riding his bicycle in St. Johns Canada; Luke captured the entire incident on his Tachyon XC Micro helmet camera. Bicyclists, motorcyclists, pedestrians and even other motorists, have always been in danger of inattentive and aggressive drivers, and things don’t seem to be getting better now that drivers seem to think that texting while driving is a good idea. As the video shows, Luke was almost hit numerous times and was nearly run off the road by an accelerating truck. In previous years, what could a person do without any evidence of the event? But now, with evidence from a personal helmet cam, victims have got the goods on these dangerous drivers; first-hand video always beats out hearsay. The Tachyon XC Micro Cam’s 90 degree wide-angle lens matches the sweet spot of human vision, without causing unnatural distortion found in ultra-wide angle cameras. The high-dynamic light sensor’s light-gathering ability allows users to document their rides in low light and at night. With a simple one-button operation, a battery life of four hours, and a 16GB micro SDHC card, cyclists can record four continuous hours of superior-quality footage, keeping their hands free and their concentration on the road ahead. For more information, videos, and to purchase a Tachyon XC Micro, visit: www.tachyoninc.com. With a tiny 3.7×1.4×1.5” profile and weighing only 4oz with batteries, the Tachyon XC Micro camera can easily be mounted to a bicycle helmet with the included 3M Dual Lock fastening tape. It also comes with a universal mount for other mounting applications. Waterproof as is, it does not require a bulky external case when under water (up to 100 ft.). The Tachyon XC Micro needs no DVR or software; it records on a MicroSDHC card (up to 32GB) and is plug-and-play with both PC and Mac®. Lewisville, TX based Tachyon™ Inc., is the premier innovator of durable, extreme helmet cameras. The Tachyon XC Micro’s ease-of-use, durability, recording time, image quality, and integrated waterproofing design make Tachyon the trusted and go-to helmet camera for people who engage in a wide-range of extreme activities. Tachyon, Inc. is an accredited member of the Better Business Bureau. (May 20, 2010) Tachyon™, Inc. –The Tachyon XC Micro Dive Camera shows off its Dive Lock feature, designed especially for divers, that allows them to easily record their deep diving footage, both hands free and worry free up to 100 ft (30 meters)(over 4 ATM). In addition to Tachyon XC’s patented shockproof system, the Tachyon XC Micro’s innovative, patent-pending locking switch is located inside the camera’s waterproof case. When the switch is locked, the watertight door closed, and the record button pushed, the camera will remain on and recording no matter what water pressure the camera is placed under. With a battery life of four hours and a 16GB micro SDHC card, divers can record four hours of hands-free, superior-quality underwater video. The Tachyon XC Micro Dive Cam’s 90 degree wide-angle lens and high-dynamic light sensor records crystal clear underwater footage, making it a valuable tool for amateur divers and professionals alike. Tachyon XC Micro users include the US Navy SEALS, scuba divers, free divers, and professional fire and rescue dive teams. The Isle of Capri Fire and Rescue dive team recently used the Tachyon XC Micro to survey the seafloor in preparation for sinking a retired Navy Frigate, the USS George Philip. The ship will be sunk off the coast of Florida, in the Gulf of Mexico, in the hopes of establishing a new reef. Lewisville, TX – based Tachyon™ Inc., is the premier innovator of durable, extreme helmet cameras. The Tachyon XC Micro’s ease-of-use, durability, recording time, image quality, and integrated waterproofing design make Tachyon the trusted and go-to helmet camera for people who engage in a wide-range of extreme activities. Tachyon, Inc. is an accredited member of the Better Business Bureau. See us at our booth. We’ll be waiting for you with cameras, recording and mounting tips, refreshments and shade. We’ll also be out in the field filming all of your paintball action. Copy your video clips to us and we’ll put them into our event videos for upload to YouTube. 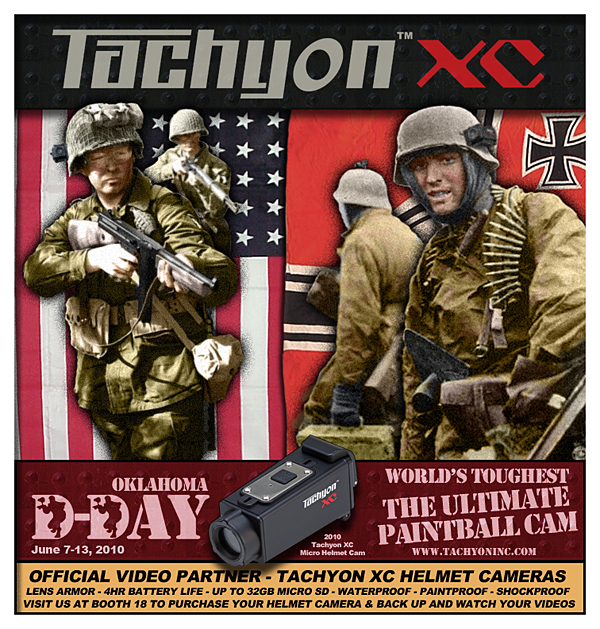 May 12, 2010 — Tachyon™, Inc., makers of the world’s toughest helmet cameras, announce their partnership with D-Day Adventure Park, home of the world’s largest paintball event. 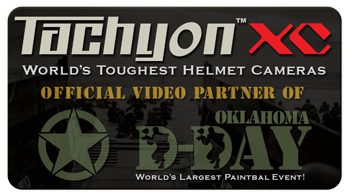 Tachyon will be an official video partner for the 2010 Oklahoma D-Day event located in Wyandotte, Oklahoma from June 6 – 13, 2010. Differing from other “Big Game” paintball events, Oklahoma D-Day hosts scenarios modeled after the Allied invasion of Normandy. In addition, mini-scenario events, qualifications, and walk-on speed events run the entire week so that participants can expect action throughout the entire seven days. Tachyon will participate not only as a vendor, but also as a film crew; documenting many of the events and games. Tachyon’s creative director Chris Whitehouse, former video game designer, will be producing a series of YouTube webisodes documenting the events. The videos will be modeled after first-person shooter games using footage recorded by Chris and by participants in the battles who use Tachyon XC helmet cameras. Tachyon encourages all of their customers at the event to submit their videos for inclusion in the final video production. Tachyon will select the best footage submitted by their customers for the videos. Tachyon will have a user lounge available for its customers, so that anyone who buys or brings their Tachyon XC or XC Micro helmet cams to the booth can relax in the shade, share videos, backup and download videos using Tachyon’s computers, and receive helpful advice. Tachyon staff will be available to help users properly mount their cameras and give recording and editing tips. Participants who wish to record and share their experiences at the events can purchase a Tachyon XC Micro camera package at Tachyon’s booth for $189.99. The package includes: Tachyon XC Micro helmet cam , 8GB MicroSDHC card, and 4 x AAA lithium batteries. Since Tachyon will have limited stock at the event, D-Day participants who pre-order the package for pick up at our booth will receive the same set for $179.99. Participants can email support(at)tachyoninc(dot)com to pre-order.